Colette has been bored and lonely ever since her best friend, Sadie, dumped her the summer before they stared high school. She tries to be perfect for everyone left in her life: her parents, her younger brothers, her church youth group, even her boyfriend, Mark. But Colette is restless. And she misses Sadie. When Sadie tells Colette that she needs her old friend to join her on a family vacation to the Greek Islands, one that leaves in only a few days, Colette is shocked to hear their old magic word: need. And she finds herself agreeing. Colette tries to relax and enjoy her Grecian surroundings but it’s not easy to go on vacation with the person who hurt you most in the world. When the reason for the trip finally surfaces, Colette finds out this is not only a fun vacation. Sadie has kept an enormous secret from Colette for years...forever. It’s a summer full of surprises, but that might be what Colette needs. First page through about 40%: This is kind of boring. 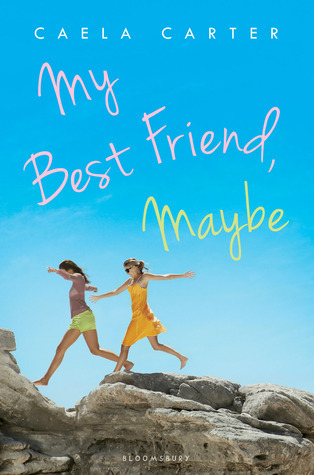 Colette has to decide whether she wants to go to Greece with her ex-best friend or Costa Rica on a mission trip with her boyfriend. What a first world problem! Wait, why is this book classified as LGBT? 40%-50%: Cute flashbacks of Colette and Sadie as kids. . . Oooh Greece sounds beautiful! Could you just tell us why on Earth Sadie invited Colette to Greece? I'm getting impatient here! 50%-66%: Oh, now things are starting to get interesting! 65%-end: Lots of up and down emotions that I sped through in a day. Beautiful ending. It took me literally a month to read the first half of the novel, which is usually a sign that I should DNF something. But I'm glad I didn't, because the last half was amazing! This is a coming of age story, but it also happens to have a LGBT twist that you might not see coming. It takes a looong time to get there, so if you can be patient (and work through feelings that Colette is obviously spoiled for having to chose between two dream trips), you won't be disappointed. Besides the slow beginning, I had a problem with Colette's characterization. I couldn't relate to her seemingly perfect religious upbringing at all. What bothered me the most was that she didn't seem to have much anxiety about choosing which trip to go on. She just kind of let whatever happened, happen. I think that's what annoyed me the most about her at the beginning. She didn't feel like she had any depth beyond the "goody-goody" persona. However, as the story went on, the layers of her personality were slowly peeled away like an onion. She grew tremendously in the second half of the novel, which made her a heroine worth cheering for. While I thought this was a well-written book, for the most part, I can't help but to wonder what's up with all of the super slow novel beginnings I've been finding lately. Thanks for the heads up about the beginning too. This is on my to-read list - I need to pick up more LGBT books.